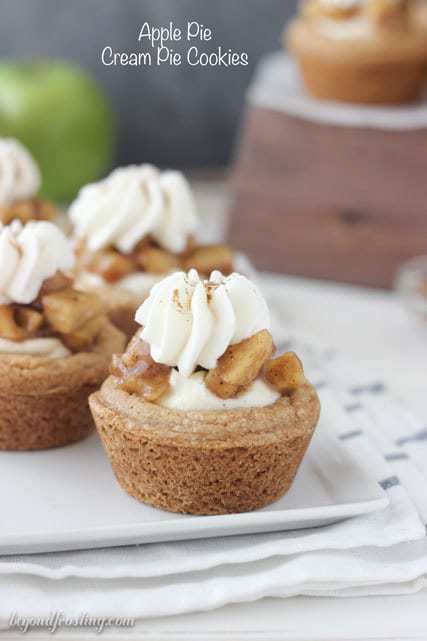 These apple pie cream pie cookies are a soft-baked cake mix cookie filled with a spiced moussed, apple pie filling and topped with whipped cream. 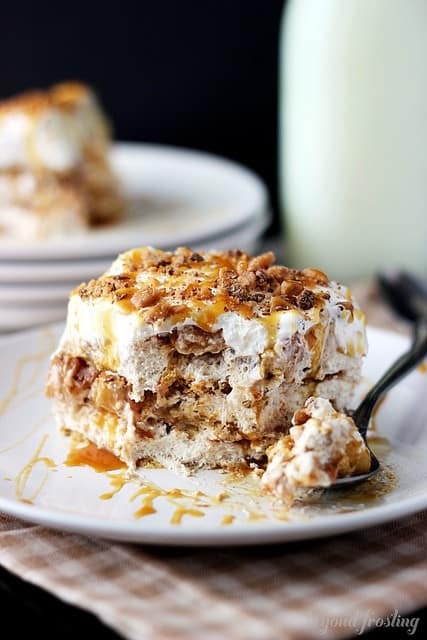 I always want to make us some special dessert for our anniversary or birthdays etc, but then we end up with a lot of leftovers which is not good for either one of us. Plus, unless it’s chocolate cake, rice krispies treats or some sort of cookies, he probably isn’t into it. Seriously, the man has better restraint on desserts than anyone! 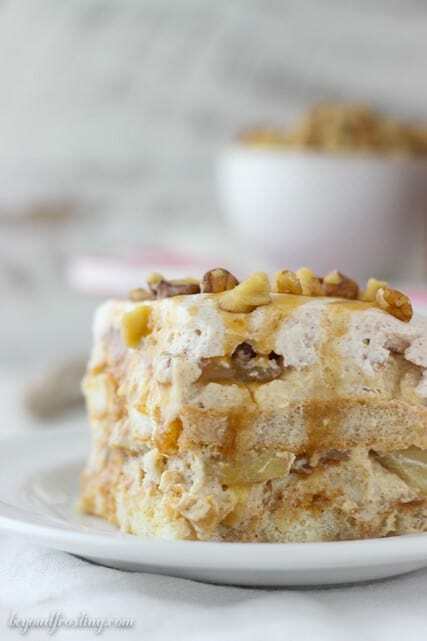 If I had made a batch of these Apple Pie Cream Pie Bars, he likely wouldn’t even try them, despite how awesome they are. I wish I had that kind of restraint because I was popping these bad larrys into my mouth left and right. 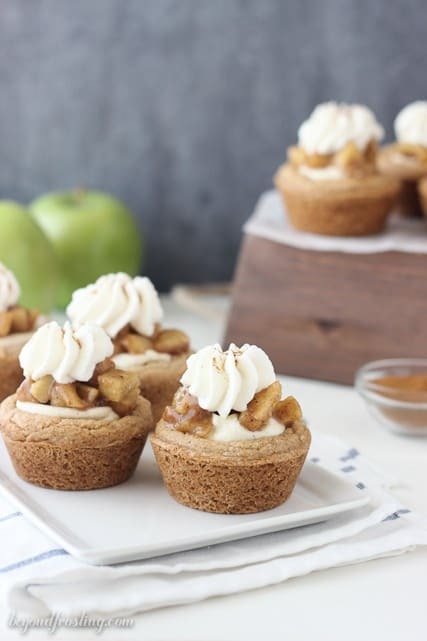 Truth be told, I made the original recipe for these last fall and never got around to post them. I think it was for the better though because now that I have a trillion cream pie cookie cups on my blog, I have perfected the formula. 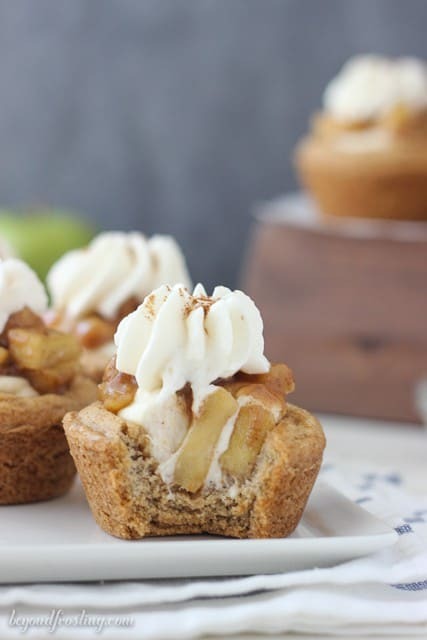 I decided these were best made as a large cookie cup, so I made them in a regular sizes muffin pan instead of a mini muffin pan. 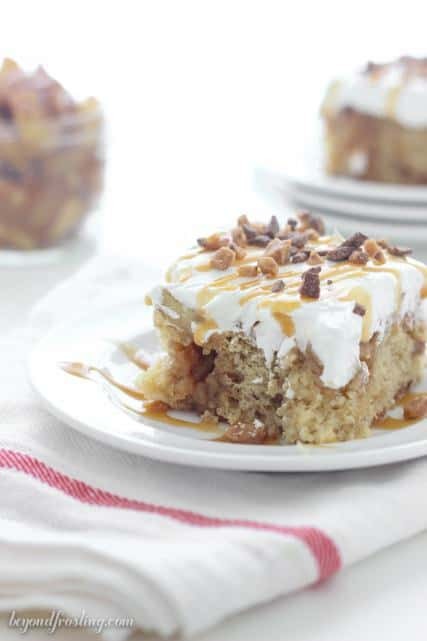 Doing so allows more room for awesome things like the spiced mousse filling and a big old scoop of apple pie filling. 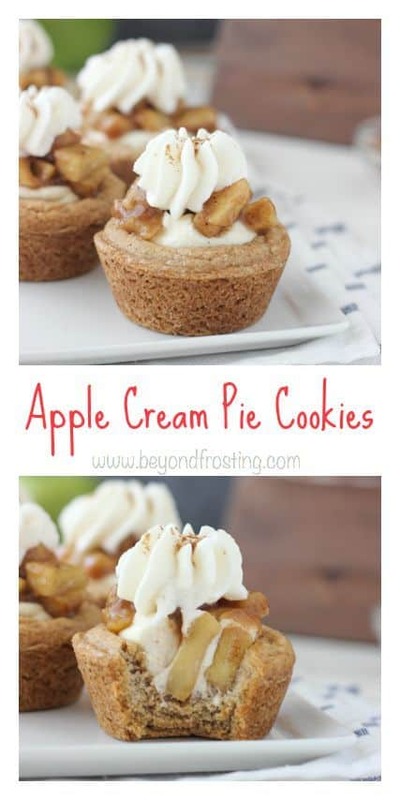 Any good cream pie cookie also needs to be topped with some whipped cream. Ya feel me? 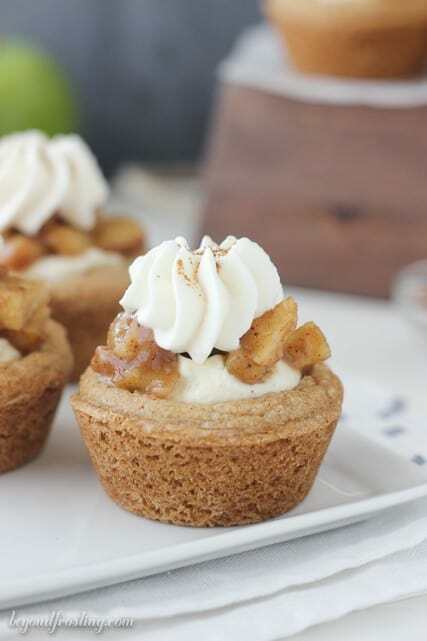 If you’re looking for a way to change up your apple pie game, give these cookie cups a try. You won’t be sorry! 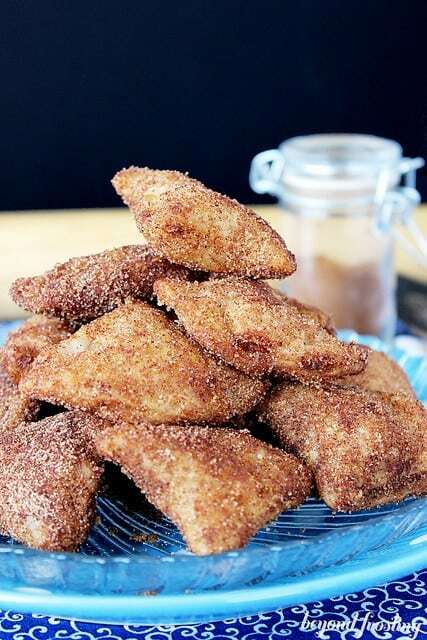 In a medium sized bowl, combine flour, cake mix, cinnamon, baking soda and salt. Stir to mix. Slowly add dry ingredients into batter and beat on a low speed until dough starts to form. Drop three tablespoons of dough into the greased muffin pan. Bake at 350°F for 18-20 minutes. Remove cookies from oven and allow to cool for at least 5 minutes. Use a tart shaper or the back of a spoon to gently push down the middle of the cookies. Allow to cool completely in the pan. Gently twist to release cookies from pan. 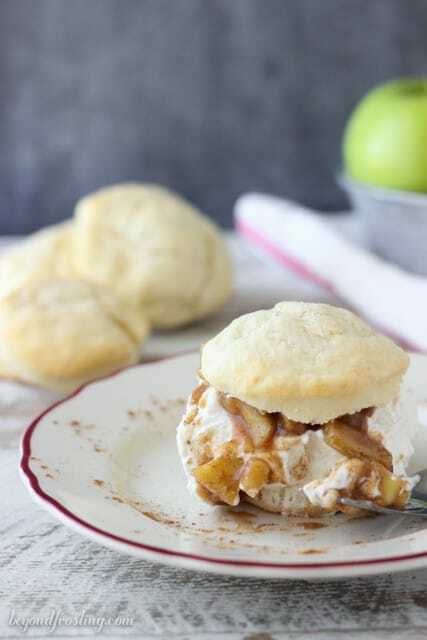 Prepare apple pie filling according to the recipe below. Combine pudding mix with cinnamon, apple pie spice and milk and until powder dissolves. Refrigerate until pudding is firm. Put mixing bowl and whisk in the freezer for 15 minutes until completely cold. Whip heavy cream on medium high speed for several minutes until bubbly. Add powdered sugar and beat on medium high until stiff peaks form. Take 1 cup of the whipped cream and fold into pudding until mixed. Do not mix vigorously as it will deflate the whipped cream. Set aside remaining whipped cream and refrigerate until you are ready to assemble cookies. Place mousse in a Ziploc bag and cut the corner of the bag. Fill each cookie cup with mousse. 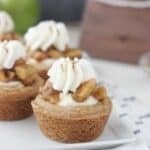 Spoon about 1 tablespoon of apple pie filling on top of filling and pipe whipped cream on top. Garnish with a sprinkle of cinnamon. Cookies must stay refrigerated. I want to pop some of these larrys too!